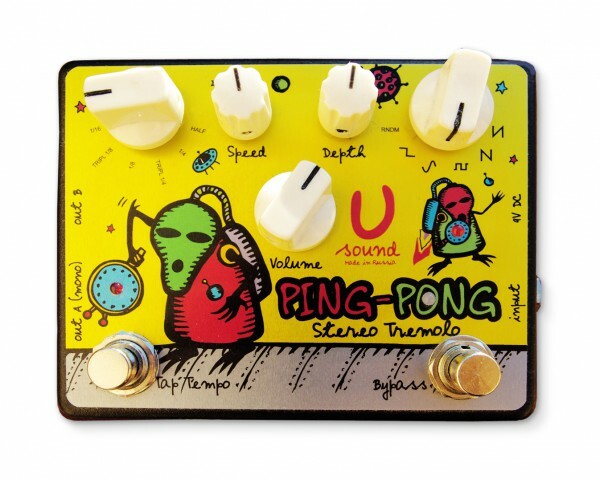 The PING-PONG pedal is a Stereo Tap Tempo Tremolo unit featuring a 100% analog signal path, and a control circuit utilizing a microcontroller. This design scheme allow the artist to develop numerous interesting and unique settings and tones. First, use the "Waveform" knob to dial in your choice of five different types of modulation waves, then use the tap tempo function to sync the pedal effect with the tempo of the music. Finally, use the "Multiplier" multi-position switch to customize the effect. Using multiplier allows you to get much faster speeds than it's possible to tap, while still allowing tap tempo control. As you can see in the video, it's super easy to dial up an infinite number of interesting sounds. 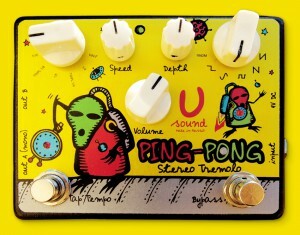 From the unique to the truly bizarre, it's all here in the PING-PONG...........in Stereooooooo. Power: 9 volt, negative center pin power supply.